Two weekends ago, DevCon held its Code Challenge Cup (C-Cup) at Xavier School Greenhills. Now while I am the current VP for Technology of the said group and spent 6 hours painstakingly checking a good chunk of the submissions, I wasn’t involved in the making of the problems (I was the tech support guy, not a “judge”). I didn’t even look at the problems until it was linked to on the event page days after the event. Anyway, being a sucker for computer science problems I’ve decided to solve all of them on my own. And given that nobody used Ruby at the event, I going to use Ruby to solve them. Note that while I’ve confirmed that the solutions below pass the judges’ test cases, they are not (yet) endorsed by any of the judges in the event. Oh, and yeah, to back up my claim that Quiwa’s Data Structures will allow you to solve most of the problems in programming competitions, I’ve included references to the said book in the solutions below. While this problem can be solved with some difficulty using brute-force, going through all possibilities of a and b in 0.001 steps, the formula for this problem (simple linear regression) is pretty straightforward. I use String#strip() in all of the problems just to be sure. I don’t really need to do it. Truncate is preferred over rounding (even though both will get full points) but Ruby doesn’t have a built-in truncate function. And so I had to make one. Unlike Python, Ruby doesn’t have a built-in sum() function. Using a full reduce() works fine but I don’t like the syntax so I chose a map–reduce form instead. This is what I’d call a “coding problem”. There are no Computer Science or Math related tricks here; the problem can be solved by anyone who knows the basics of programming e.g. 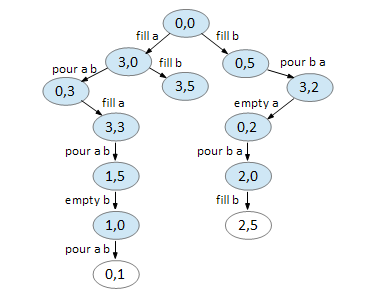 basic data structures, string manipulation, and sorting. Line 20 creates a translation table/hash which we’ll use to translate the words. Line 21 – 24 creates a new array containing word pairs consisting of the input words and their equivalent words in the Ripley alphabet. 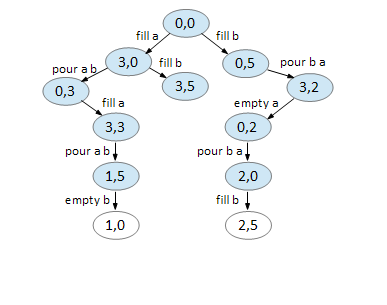 This is the first problem whose solution you could find in Data Structures. A major district in the problem is a vertex, once removed, produces a graph where there is no path between one or more pairs of vertices. This can easily be determined once you have a transitive closure for the graph, which we will construct using Warshall’s algorithm. Line 46 determines if the district is major by checking for the existence of falses in the adjacency matrix. 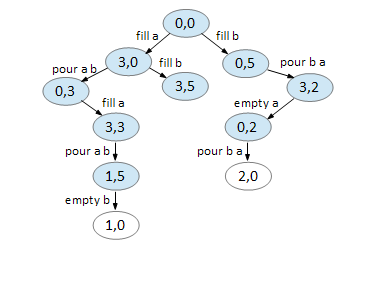 This problem can be solved in many ways, with the simplest being graph traversal algorithms. And the simplest of those is depth-first search which is used by the code above. Look for an island tip closest to the top. Use DFS to delete the island piece by piece. Repeat until there are no islands left. Another coding problem. Expect to fail many technical interviews if you can’t program this in less than 30 minutes. The existence of Array#count() makes this problem too easy in Ruby. Like Problem A, this problem can be solved either through brute-force or having knowledge of microeconomics or mathematical optimization. And it can be solved using blind luck. We need to find the path between two points in the graph that produces the highest probability. Calculating probability of independent events is simple (just multiply them all together) while finding the path is only a matter of choosing which pathfinding algorithm to choose. For the code above, I chose the most common algorithm: Dijkstra’s Algorithm. Line 24 onwards is a direct implementation of the algorithm from the book. The easiest problem of the set. All it takes is for you to know how to calculate the GCF of two numbers efficiently. If you’re not using Ruby or Python (which has built in GCD functions), you can code the Euclidian Algorithm in less than a minute. 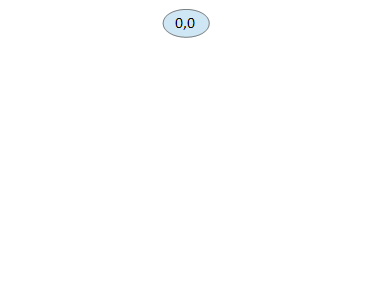 We start with our first node, representing 0 gallons for jug A and 0 gallons for jug B. We can only do two things, fill A and fill B. All other moves returns you to the same node. 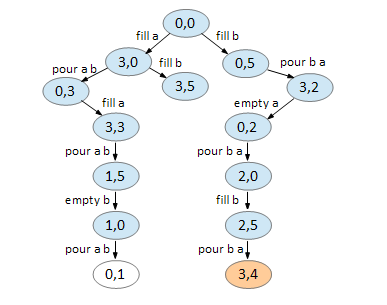 On node (3,0), we can fill B and pour A B. Again, all else returns you to a previously visited node. 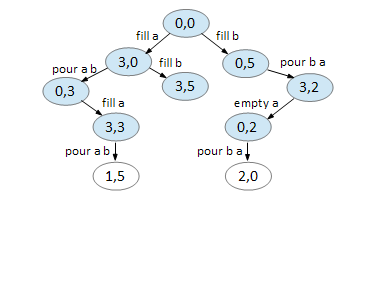 On node (0,5), we can only fill A and pour B A. Note that (3,5) has already been created in the previous step. Node (3,5) is a dead end. 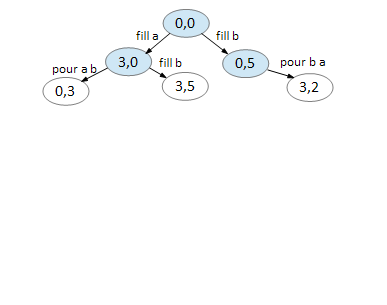 On node (0,3), we can fill A. 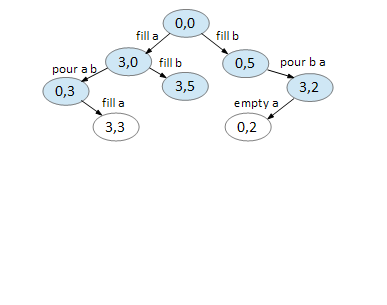 On node (3,2), we can empty A. 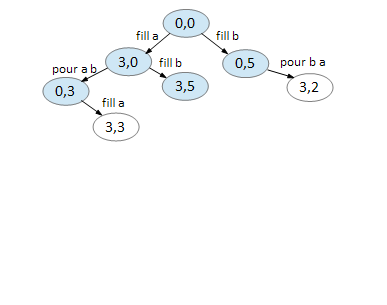 On node (3,3), we can pour A B. 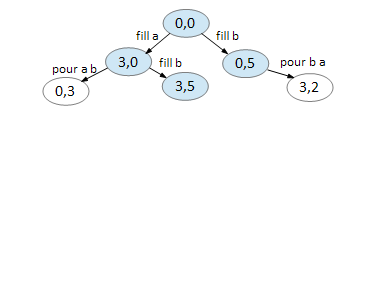 On node (0,2), we can pour B A. 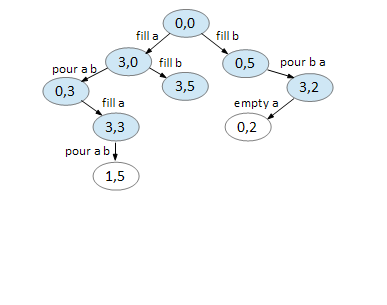 On node (1,5), we can empty B. 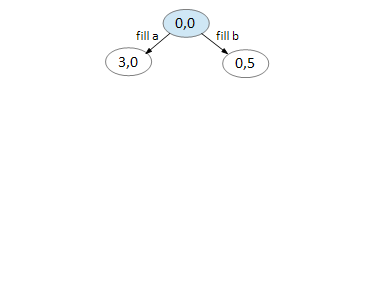 On node (2,0), we can fill B. On node (1,0), we can pour A B. On node (2,5), we can pour B A leaving 4 gallons on jug B.
Backtracking, we now have our solution. My BFS implementation is kinda weird in that it doesn’t use a real queue (it uses a simple array) and we store the back edges along with the action in a hash of a hash. The solution above also finds the solution for putting N gallons in jug B. According to the spec, you only need to put the water in either jug. We’ll just leave modifying the solution above to do this as your assignment. Last and probably one of the least, we have this coding problem. Your main problem here is how to calculate factorials – using normal integers, you’ll get to the integer limit very quickly. There are many clever ways of calculating the last non-zero digit of a factorial, but there’s really no need to do that. 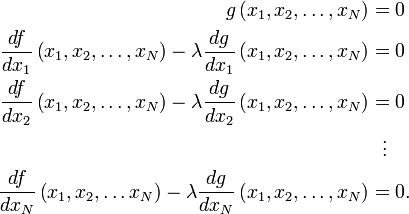 Using arbitrary-precision arithmetic (e.g. Java’s BigInteger) you can calculate 10000! in all of the given languages in less than a second using less than 1MB of memory. 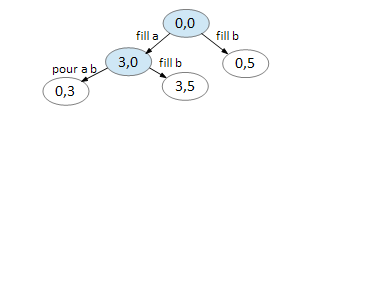 (1..n).reduce(:*) – calculate factorial using reduce(). Ruby automatically converts integers to Bignum when they reach a certain size. In other words, it’s a pretty good problem set for programmers of all levels. I might even go as to say that, given enough time, a second-year Computer Science student should be able to answer 8 of them armed only with a laptop, their textbooks, and a complete programming language API.